We try our best, but I think it is safe to say that when it comes to gardening, we’re not the best! However, this never puts the girls off trying, so they were very excited when Innocent offered them a little gardening kit to get them started. 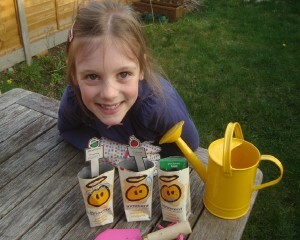 They received a shiny new watering can, some special seed packs, some tools, stickers and money off vouchers. Grace was keen to get started planting one day after school so we used the empty smoothie cartons, which we cut the tops off and washed out. Luckily, until the end of April, every box of Innocent kids’ smoothies and fruit tubes comes with a pack of easy to grow seeds so if these don’t grow then we will get another chance! There are six different varieties to collect including carrots, tomatoes, cress, basil, violets and sunflowers. Also check out the innocent kids website for lots of fun facts and top gardening tips. Take a look at the photo below – where do you think we have hidden our seeds*? Leave a comment to let me know and enter the giveaway. The giveaway will be open until 10pm on Tuesday 2nd April, when I will choose a winner from the correct answers using random.org. I will pass the winner’s details onto Innocent, who will arrange for your prize to be delivered to you. 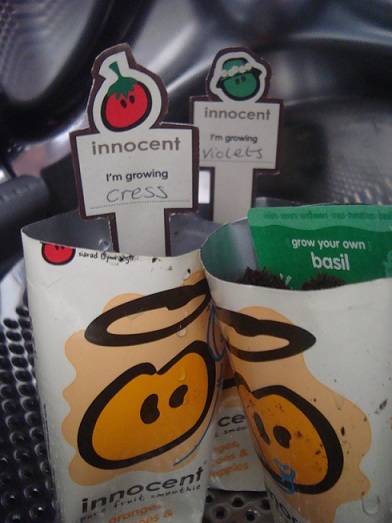 Disclosure: We were sent a free gardening kit, seeds and money off vouchers by Innocent. Thanks for your entries. Random.org chose number 4, which is Mandy. Congrats! I’ll be in touch with you soon.